We’ve seen touts from the Great Wall of China, to the Egyptian pyramids to under the Eiffel Tower. People have tried to sell us things on the top of hills, in boats and amongst ancient ruins. And every single one of them would be weeping in frustration at the amazing thing we saw today. Our day started with an emergency trip to the local supermarket which was closed yesterday. Manarola is way to small to have a full supermarket; the local COOP is barely a glorified corner store. 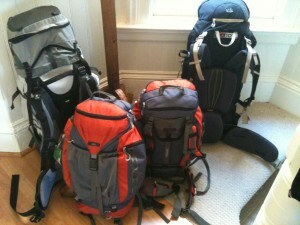 I have a feeling the locals must make weekly trips to somewhere more substantial. It did, however, stock the immediate essentials of milk, cornflakes and muesli. Taken together with a stock of coffee brought from France we had all we needed for a breakfast on our roof terrace. 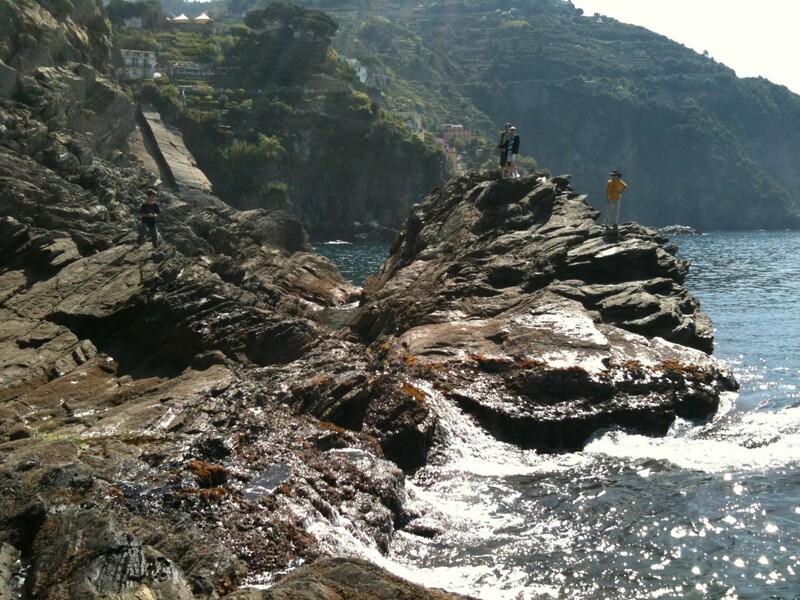 One of the reasons we chose to come to Cinque Terre was the extensive network of walking tracks in the area. The core of these is the 12km of cliffside track that connects each of the towns by the sea like the rope on a string of pearls. Sadly we discovered that almost the entire length of track is closed at the moment. 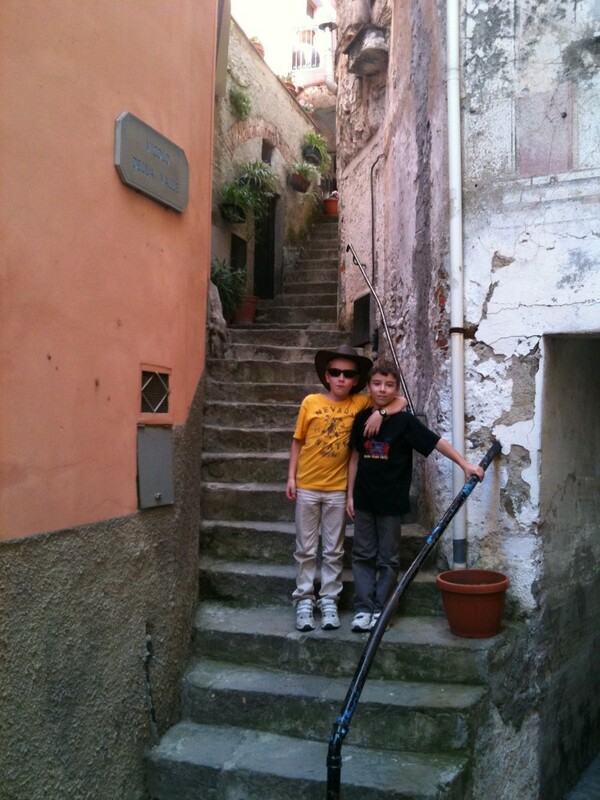 The only bit that’s open is the tiny section between Manarola and Roimaggiore, called the Via del Amore. So our plan for the day was to walk this section and explore. By the time we’d finished with schoolwork it was 11am and the sun was thoroughly in its appropriate position in the sky. It was also late enough for the tour groups to have arrived. We almost gave the entire outing away when we saw the thick crowds of people around the tourist office where you have to buy a ticket for the path. Why on earth people need a guided tour along a couple of kilometres of cliff path is beyond us. Luckily we persevered and the crowds seemed to evaporate on the path itself. Padlocks on the Via del Amore. The path was originally built to provide better access between the towns. Some bright spark took note of the spectacular views and named it the path of love. The result is sort of amusing. Every available surface has a couple’s names painted, scrawled, or carved into it. The plants are no exception – although you can’t help but wonder what that choice of medium says about the permanence of the relationship being commemorated. And then there are the padlocks. Because the area is made of cliffs of limestone and marble it is prone to rockslides. Much of the cliff is therefore protected by thick wire-mesh to hold the rocks in place. The mesh provides a perfect place to attach padlocks inscribed with lovers names. As do the railings of the protective fence. And the sides of the seats along the way. And absolutely any other surface you can latch a padlock to. Looking back at Via del Amore and our lunchtime cafe. 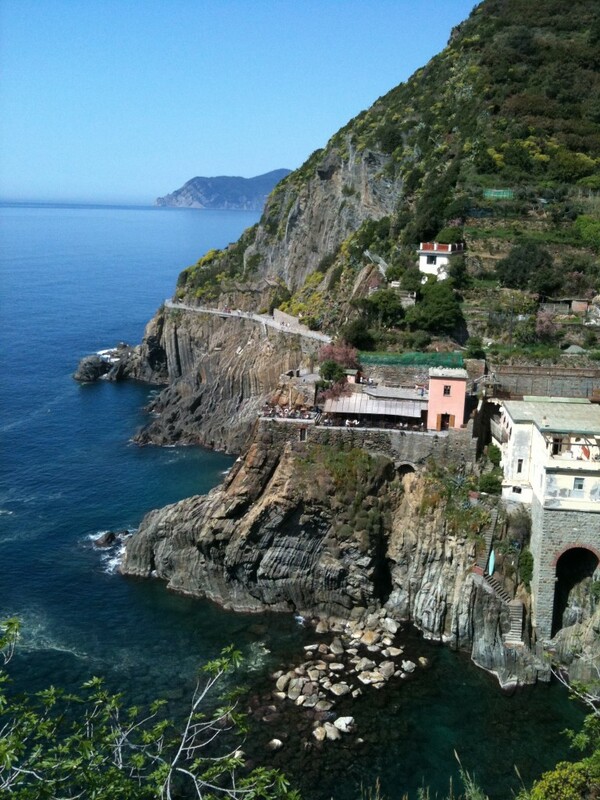 Looking out from the path presents a great view of the Mediterranean Sea and the towering cliffs of Cinque Terre. Today the Sea looks as flat as glass with only a very occasional boat providing a few ripples. When you look down near the base of the cliffs the water is a deep, clear green colour allowing you to see right to the sea-bed. If it was only a couple of degrees warmer the temptation to jump in would be irresistible. Riomaggiorre is a slightly bigger town than Manarola but otherwise similar. Both are centred on their train station and small harbours protected by breakwaters. The surrounding streets are tiny and winding and very steep. Often a street will become a set of steps or a tunnel as the hilly construction has someone building from one level to another. Apart from the hills the towns remind me of Venice with tiny car-less streets built around natural features rather than a planner’s whim. We had lunch in a lovely shaded cafe on the cliffs overlooking the harbour. Jennifer and I tried the local delicacy which is a rice pie. As the name suggests it’s a pie made with, well, rice in a very thin pastry. It’s tasty but I can see why it hasn’t taken the world by storm. Rice pie is traditional around here because the steeply terraced farms are useless for growing cereals and so flour was a real treat in the area. We treated ourselves to gelato as we explored the rest of the town. Rock climbing by the sea. The boys did some serious climbing around the boulders of the breakwater as we walked around to the local beach. Sort of unsurprisingly ‘beach’ for these purposes translates as sort of flat place with lots of rocks. The lack of sand either does not stop or positively encourages the local visitors to sunbathe on every other remotely flat surface. To Australian eyes it looks strange – partly because we tend to do our sunbathing on beaches and partly because we’re simply too paranoid about skin cancer to make this sort of concerted effort to get suntanned any more. As we walked back along the Via del Amore with its bristling outcrops of padlocks looking like some strange urban growths, Callum entertained himself by pondering what you could build if you melted down all the padlocks: a plane, a ship, an aircraft carrier? And then the truly amazing thing about the path of love and the surrounding towns occurred to me. The truly, truly amazing thing is that the local shops don’t sell padlocks. On the Via del Amore. Ha…I can match that! 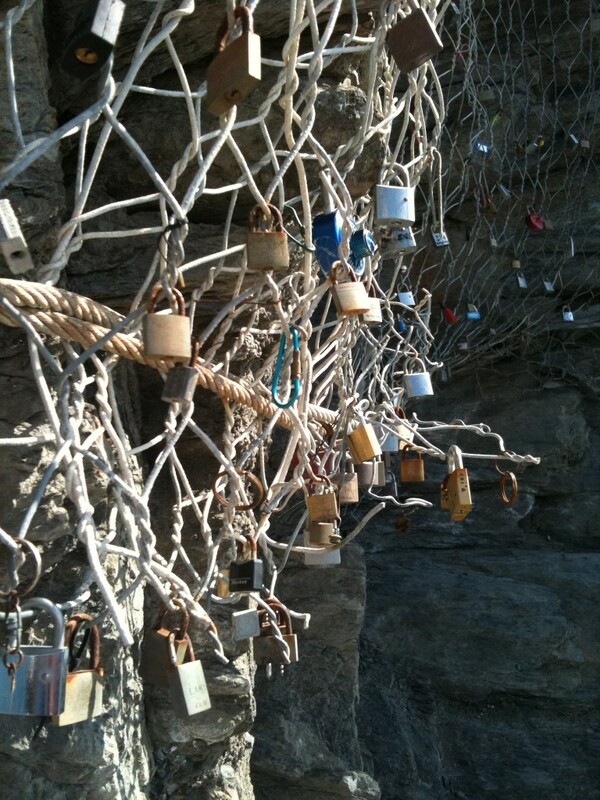 The new cliff side road to stanwell park is festooned with padlocks. Who needs to travel halfway across the world? How long before young lovers dispense with the padlocks and hang out SSL Certificates instead, I wonder.